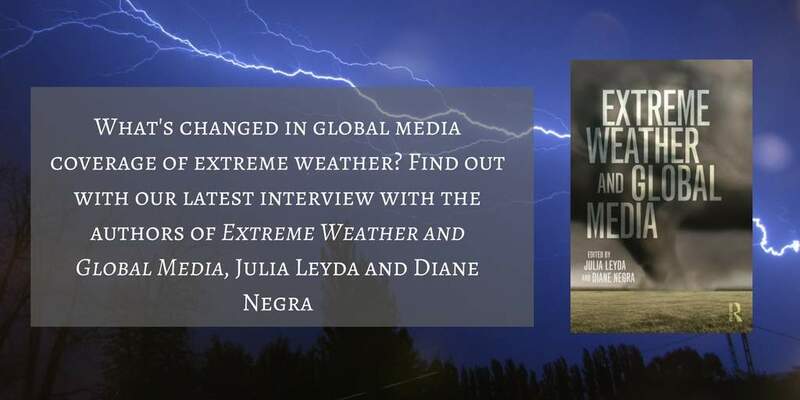 Julia Leyda and Diane Negra, authors of Extreme Weather and Global Media, answer a few questions about the impacts of hurricanes Harvey and Irma in light of their 2015 research on media coverage of such disasters. Julia Leyda is Associate Professor of Film Studies in the Department of Art and Media Studies at the Norwegian University of Science and Technology (NTNU). Her most recent book is The Aesthetics and Affects of Cuteness (co-edited with Joshua Paul Dale, Joyce Goggin, Anthony P. McIntyre, and Diane Negra, 2017). Her current research in contemporary film and television centers on the financialization of domestic space and climate change narratives (cli-fi). Diane Negra is Professor of Film Studies and Screen Culture and Head of Film Studies at University College Dublin. A member of the Royal Irish Academy, she is the author, editor or co-editor of ten books including What a Girl Wants? : The Reclamation of Self in Postfeminism (2008) and Extreme Weather and Global Media (with Julia Leyda, 2015). Her work in media, gender and cultural studies has been widely influential and recognized with a range of research awards and fellowships, including an award from the Government of Japan that led to a lecture tour in that country.She currently serves as Co-Editor-in- Chief of Television and New Media. Based on the natural disasters you’ve covered in Extreme Weather and Global Media, has the impact of hurricanes Harvey and Irma been similar in the media? How do you see these two hurricanes affecting the public’s perception of such disasters going forward? Has anything changed in the way the media covered these hurricanes? The first thing to say is that these are not “natural” disasters. We know now that these hurricanes are stronger and more frequent as a direct result of anthropogenic climate change. There have been hurricanes since before humans began consuming fossil fuels, but they have become much worse in the last few decades. Climate change denial, complacency, and diminished public resourcing and planning play a huge part in the scale of the destruction we are now seeing, from the lack of levee maintenance that led to the inundation of New Orleans, to the inattention to zoning and disaster preparedness that made Houston vulnerable to such large-scale flooding. Increasingly, as we point out in the book, the responsibility to be prepared and to evacuate safely is abdicated by the state and shunted onto individuals, which leads to uneven vulnerabilities along predictable lines of race, ethnicity, and class, as well as age and ability. The coverage of Hurricanes Harvey and Irma has broadly complied with and also elaborated the representational protocols we unpack in the book (i.e. not just one meteorologist standing out in the storm but teams of them). As we have seen before, a heavy emphasis on "breaking news" prompts a representational frenzy of a few days' intensity and not much follow-up coverage. Also familiar is the way in which zealous coverage of US storms parallels a near total lack of reporting on similar yet far more deadly events elsewhere, as for instance the recent catastrophic flooding in South Asia and Africa, which was treated (if at all) as a kind of “grace note” to the US hurricanes. On the global scale, now as then, climate change continues to wreak far worse harm on vulnerable populations in the developing world who have historically contributed the least to global warming, while the gross disparity in media attention continues to add insult to injury. If you accept the argument we make in the book that weather frequently functions as a phatic discourse through which we test and debate in a concentrated way the sense of risk and vulnerability associated with neoliberal social and economic life, surely that sense of things has heightened under the administration of Donald Trump. Numerous elements of popular culture have shifted toward the dystopian and we would argue that weather disasters now feel less exceptional and more routine, more closely tied to a narrative of decline in which US infrastructure, social health, and economic security are widely considered to be in jeopardy. Just as 9/11 furthered patterns of cell phone acquisition, devastating storms and their aftermaths are reinforcing a sense of digital citizenship. We would predict that social media will continue to feature ever more prominently in such events. The mobilization of volunteers, for instance, including the “Cajun Navy” via its Facebook group, attracts news media attention which is then itself shared and circulated via the online social networks—this unquestionably helps to mitigate some of the demand for assistance in the immediate aftermath and fuel the continued privatization of once-public provisions of aid and support. After Superstorm Sandy, we saw public officials from both major parties (Chris Christie, Michael Bloomberg, Andrew Cuomo) acknowledging that climate change was a contributing factor, and pledging to act. Five years later, in a radically different political climate, the aftermath of these massive storms brings a marked reluctance on the part of Republican politicians to address or acknowledge it. The discourse on recovery after these storms has been interestingly split with an emphasis on unity marked by celebrations of heroic rescuers, tenacious meteorologists who observed extensive on-air vigils, and celebrity telethons on the one hand, but also a competitive regionalism that features in many of the comments on news articles about Hurricanes Irma and Harvey where posters argue that these heavily Republican Southern regions whose political representatives often voted against aid for places like New Jersey and New York after Superstorm Sandy should suffer the consequences of climate change denial. The politicization of disaster thus seems to be intensifying in some ways, indexing the escalating polarization plaguing the US body politic as a whole. For a better comparision of how much things have changed since in global coverage disasters, we've included our 2015 interviw with the editors. What prompted you to write Extreme Weather and Global Media? We both had personal connections to New Orleans, and thus were strongly affected by the Katrina disaster and its mediations. When the March 11 tsunami and subsequent nuclear disaster struck Japan, where Julia was based, we joined forces to organize an international symposium that drew together scholars to look at the disasters in tandem, which led to our decision to focus more closely on the growing prevalence of media discourses on extreme weather and the different ways they play out in various national contexts.Although the US provides the most flagrant examples, it’s clear that the commercialization of weather and its production as a new category of media entertainmentare transnational trends. Is there anything you want your readers to take away from Extreme Weather and Global Media? / What’s the one thing you hope readers take away from your book? There are certain threads running through the book that, taken together, constitute a clear argument: our world is increasingly affected by extreme weather, but perhaps more importantly, the way we experience extreme weather is shaped by how we understand it via media sources. Perhaps it is more common nowadays to view entertainment (movies, television series) critically, but we also wanted to foreground the ways in which “ordinary” television, as Frances Bonner terms it, participates in subject formation and informs the affective ecologies that make up our daily lives. Is there a part or chapter of the book that resonates the best with you? Perhaps an area you might call a specialty or favorite? Maybe because of our experiences as American academics based outside the country, the analysis in Laura Beltz Imaoka’s chapter and elsewhere in the book of the ways in which weather is analyzed for the way it is made to articulate foreign threats (in her chapter, the paranoia about wind-borne radiation) into the sanctity of the American homeland really resonated. Yet what so many of the chapters demonstrate is that each country has unique ways of “nationalizing” extreme weather discourses. What challenges did you face while writing the book? This was a new research area for many of the book’s contributors and we really commend them for moving into largely unexplored intellectual terrain. There wasn’t a unified or well-developed body of literature for them to draw on so they really had to carve out their own paths. There have been several excellent books focusing on particular weather events, such as Katrina (including Diane’s book Old and New Media after Katrina). There have been individual essays and book chapters that begin to theorize how extreme weather is mediated, but no book-length studies. And though climate change studies and environmental humanities are in a strong growth phase right now, we felt that this focus could both contribute to those areas of inquiry, and also develop a special emphasis of its own. A comment element in media coverage is to conflate weather with other phenomena like earthquakes. Another is to attribute the term “natural” where it really doesn’t apply. In the context of climate change related to destructive environmental behavior, there are very few weather events that could actually fulfill the criteria implied by that term. We maintain that extreme weather is a major mode of media representation that is hiding in plain sight – scholarly notice of it remains scant and our book seeks to remedy this inattention. What findings in writing or researching the book surprised you? It’s not so much a research finding as a new manifestation of the representational culture of extreme weather but we have been really interested to see how weather has moved right into the center of US news coverage. For instance, this summer if you were to watch a broadcast of ABC’s World News Tonight not only it is typical for it to lead with an extreme weather story, but the network meteorologist pulls up a chair to the anchor’s desk within minutes of the start of the broadcast and gives a rundown on fires, floods, etc. across the nation. This occurs on a nightly basis and illustrates how regularized coverage of extreme weather has now become.